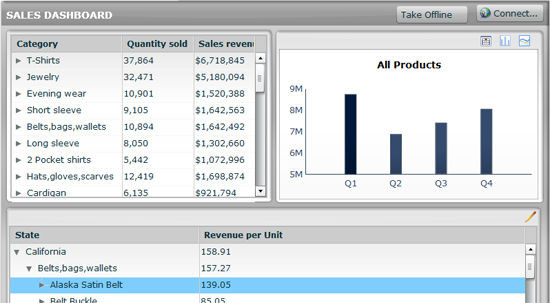 When I started educating customers on business intelligence dashboards in the early 2000s, we used a term “eye candy for executives.” This term was coined thanks to the flashy graphics and over the top shiny look and feel for Xcelsius. This emotional effect that Xcelsius has on customers is amazing and to this day I truly enjoy sharing the technology with new customers. This emotional effect that Xcelsius had on businesses helped propel the Xcelsius forward because it simply looked better. The gauge visual control was certainly the most exciting item that every customer wanted. I am guilty as charged for using these controls over the years, but can’t remember the last time I used one in a customer project… and there is a very good reason. Dashboards provide an appealing user experience to dive into business information. The customers and professionals who deploy dashboards are collectively more educated, thanks to the specialists who have provided guidance on effective methods for communicating quantitative information. 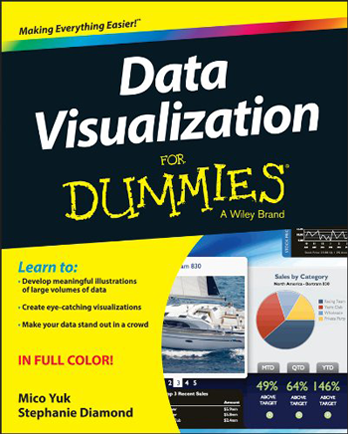 When web 2.0 and business intelligence collided there were only a few places consumers could go to for education on visualization for business intelligence. 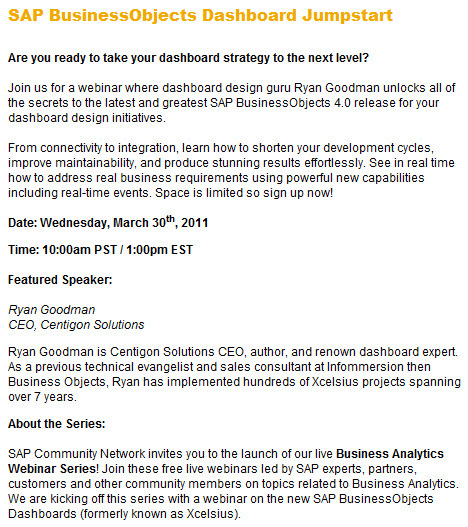 Now there are large communities focused on this topic, just like EverythingXcelsius; Dashboard Insight is my favorite. Though gauges are extremely effective in gaining your attention, it only slows down an you ability to digest the information. Gauges also take up valuable real estate, even when you cut them in half! 1. Use a text value- If you create a gauge and can’t figure out what the min and max values should be, delete the gauge immediately. You are best served placing a value or text control on the screen to display the value(s). 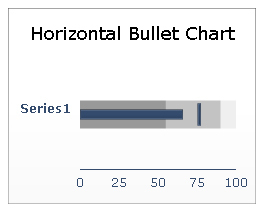 Use a bullet chart- If your value has an associated target, the bullet chart is your best bet, especially if you have multiple values that you would like to display with un-like measures or scales. Use a bar / combo chart- If you have more than 3 gauges with the same measure and scale, you should replace them with a single bar chart or combination chart. With Xcelsius you also have an interesting vertical bullet chart capable of showing actual/target. Hopefully if your are researching using gauges for your dashboard this article will help steer you clear of dis-servicing your end user. I would love to hear your opinions on this long lasting Gauge debate. Software as-a-service applications like Salesforce.com and Google Maps Premier enable organizations of all sizes to offload operational and infrastructure costs associated with on-premise software. Organizations that have made significant investments in on-premise business intelligence are now mashing up data from web-based solutions thanks to powerful APIs. In the last year, Salesforce.com and Google Maps integrations for Xcelsius have popped up making it easier than ever to integrate these technologies without any coding. Third party software solution providers like Centigon Solutions and Moss Solutions are bridging the gaps between these powerful web-based platforms and Xcelsius. 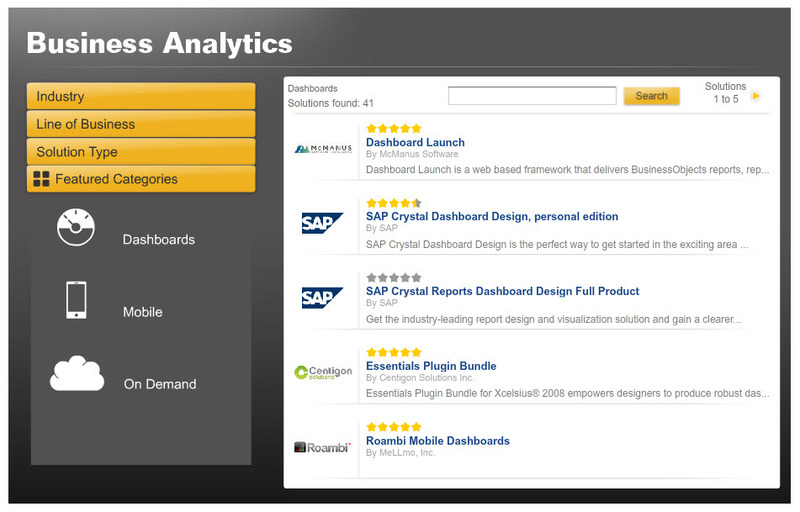 For Salesforce.com users, you now have the perfect solution to easily load and analyze data within Xcelsius dashboards. Last year, I was introduced to David Moss of Moss Solutions, who developed the Force.com Integration for Xcelsius. As a technologist I was obviously interested to see how he designed the solution, but as a Salesforce.com customer I was even more excited to see how I could use the integration for my own business. The Force.com Integration for Xcelsius connects directly to Salesforce.com reports, even if your organization uses custom SFDC fields, objects, and report types. The integration leverages all of the filtering, summarization, layout, etc. defined within the Salesforce.com reports, making the integration extremely simple to implement and manage for the user of the component. As an Xcelsius developer, you can use either a SFDC Connector within the Xcelsius data manager, or an interactive table component which provides inline drilling, grouping, ad-hoc filtering, and navigation of Salesforce.com report data. This tabular component is rich in functionality providing a simple way to drill through large volumes of data with extremely fast performance. A full list of features is available here at Moss Solutions. 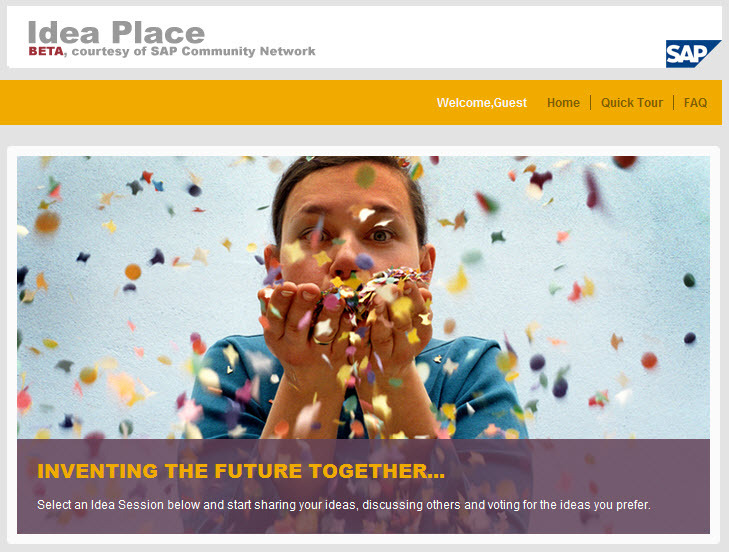 David and I collaborated last year on a demonstration that I shared at the BusinessObjects user conference. The story behind the dashboard is a real customer use case to understand campaign effectiveness. Our customer’s campaigns invited targeted members to attend one in a series of local trade shows across the US. With lead information and conversion data captured at the tradeshows, the customer wanted to visually analyze who attended the trade show and to what extent the lead interacted with our customer. With a simple Salesforce.com report we could easily view the regional campaigns and view the leads. The report resulted in pages of data, which provided no insight to performance. Using out of the box Xcelsius functionality, we were able to plug in the campaign costs and dynamically calculate financial ratios related to ROI. Using some more advanced calculations we could actually calculate effectiveness of a campaign based on the lead’s proximity from the event. This is the real value that customers want to uncover from dashboard applications and we are on the right path to make this analysis much easier to create. If you are a Salesforce.com customer who is seeking a way to extract valuable analysis outside of the web-based tools out there, I highly suggest you take a look at the Force.com Integration for Xcelsius from Moss Solutions. You may sign-up for a trial at http://david-moss.com/registration . 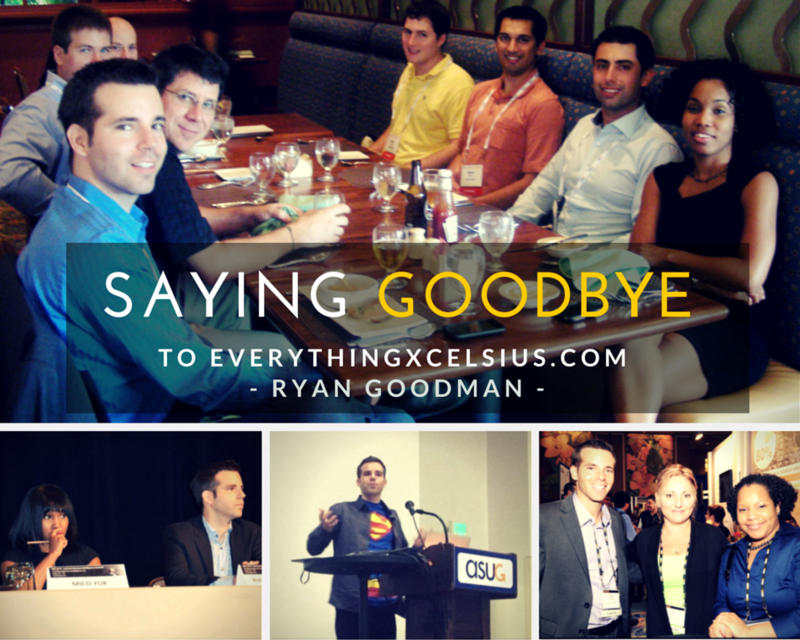 Feel free to ping me with any questions about my experiences with the technology and how I am going to implement it within my own organization. Top 10 Xcelsius 2008 SP3 Enhancements! BusinessObjects’ release of Xcelsius 2008 SP3 is a great step forward for customers to benefit from new charting, performance enhancements, and other capabilities that make dashboard development easier. For fellow Xcelsius customers and developers who have been patiently waiting for new functionality, this release is the one we have been waiting for. With a commitment to improve performance, there is a new option to optimize Excel performance in addition to promises of improvements to other previous performance concerns both inside of the Xcelsius design environment and runtime SWF files. 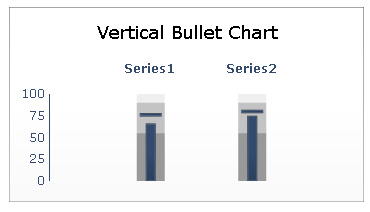 A Steven Few inspired component set, the Bullet chart provides a new visualization tool for Xcelsius developers who want to maximize screen real estate while communicating more data. Sparklines are the second new charting edition to Xcelsius that also provide significant value for organizations who want to leverage the popular data visualization control within Xcelsius. Previously only attained with add-on components, this functionality comes packaged with Xcelsius. In Xcelsius, staging data for visualization has long contributed to the learning curve required for building excellent dashboards. As a step forward to make selector configuration easier, the Xcelsius team has exposed new global properties for selectors. Hopefully this is only the first step to seeing significant improvements to selectors since this is the most powerful yet difficult concept to learn in Xcelsius. No selection- Sometimes a developer does not want a selector to trigger until it is clicked on. While this request is simple in concept, this functionality was not available until now. For the casual Xcelsius developer this is not a major feature until it becomes a requirement, but those fellow developers who have experienced this limitation will appreciate this feature. Multi-selection- Another developer-centric feature, multi-selection capabilities will enable a dashboard to trigger multiple events which was previously accomplished with workarounds (Excel logic and hidden selectors). The first time you open a standard selector, developers will noticed a revised property sheet UI that is extremely easy to pick up using previous Xcelsius experience. Sorting- The chart sorting requirements traditionally fulfilled with Excel logic or add-on components are now fulfilled for charts using a new sort behavior. Accessible in the chart behavior tab during design time, this functionality is extremely valuable when data is not loaded into a dashboard pre-sorted. Labeling- As one of the most commonly requested features for Xcelsius, visible chart labels is now available simply by checking a box in the chart appearance tab under labels. Enable value and series label functionality and format them according to your design specifications. To fill in IMT time slider capabilities previously available in BusinessObjects performance manager, developers can extend flexibility for end users to focus on a specific range within a time series using a dual slider. 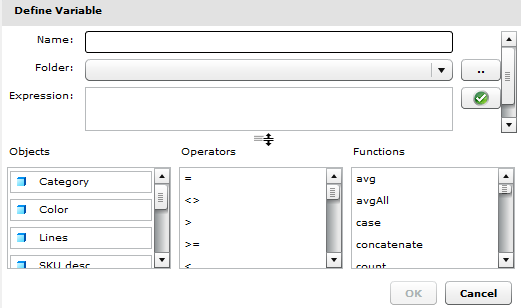 Built directly into the Xcelsius chart components, you can easily enable this functionality in the behavior tab. As one of my personal favorites, you can now bind any color to the spreadsheet using a simple color binding option. For any existing Xcelsius developers who have struggled aligning icons or hidden selectors, a real scorecard component will be a breath of fresh air, making it a relatively simple process for configuring alert indicators within a vertical table. I can instantly see a lot of opportunities to expand on this component, so I am interested to hear the community use cases for this new component. This is a nice component for new Xcelsius developers who want to group components without learning dynamic visibility. This component is available with the other container components. 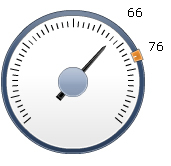 Gauges have long been criticized for consuming a large volume of screen real estate without displaying enough information within the control. For customers who insist on using these controls, Xcelsius offers additional capabilities previously available in BusinessObjects performance manager. Bind multiple values to a single gauge and track them as marker indicators or additional needles. From the second you open the gauge property sheet, you can easily take advantage of these new features using the same paradigm you have always used. Please download SP3 directly from SAP Software Download Site.